An unexpected adventure changes a frog for the better — whether he likes it or not — in a modern-day fable that challenges readers to see their own world in a new way. Once there was a frog who lived under a rock by himself. Every day he did the same thing. Swimming to the pond to get breakfast, jumping onto a log to enjoy the sun, heading back to crawl under his rock again — this is one frog who likes to keep to his routine. So when some noisy otters and blue jays move in, and a giant pine crashes into the pond and messes things up, this frog is none too pleased. Still, that's nothing compared to his shock when a jar descends from above and he's whisked away in the hands of a little boy, only to find himself lost and alone in a strange new place. Now our frog's on a journey full of many dangers — and many wonders, too. Will he ever see his familiar pond again? John Lechner is an artist, animator, multimedia designer, and puppeteer. 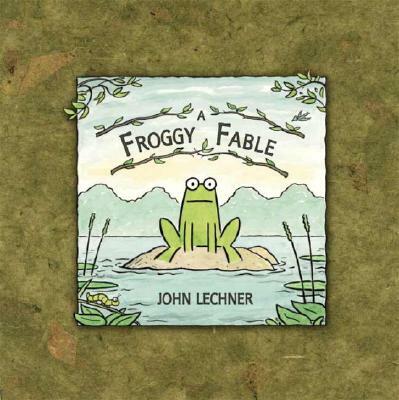 A FROGGY FABLE is his first picture book. "This story grew out of my own experiences with change," he says, "but I hope readers take away their own personal meaning from it."